September 4, 2018 - Power supply to North India including Delhi and Uttar Pradesh, Bihar, Jharkhand and West Bengal is vulnerable to disruptions as fuel supply to 4,200 mw of generation capacity that feeds these states has fallen sharply heightening the risk of a shutdown from events like heavy rain. Coal India’s supply has fallen because the mine supplying coal to NTPC’s large plants in the east has almost run out of pit head stock, while land acquisition problems have stymied expansion. Coal India’s supply from Rajmahal mines in Jharkhand has fallen to 40,000 tonnes a day from about 55,000 tonnes. On a rainy day, the supply halves. At NTPC’s Farakka plant, stocks have plummeted to 4,000 tonnes from 2.5 lakh tonnes almost two months ago, said a senior NTPCNSE official. At the Kahalgaon plant, stocks tumbled to 45,000 tonnes from 5 lakh tonnes two months ago, forcing the company to scale down generation levels to 60% and 80% at Farakka and Kahalgaon power plants respectively from around 90% for both plants, the executive told ET. The issue has been escalated to the central government, which is monitoring the situation, executives said. A Coal India executive said reserves at Rajmahal mines is almost depleted but it can be replenished by acquiring land in two villages, Bansbiha and Taljhari adjacent to the existing project. But villagers were reluctant to part with land when local authorities issued notices for acquisition two years ago have now agreed, he said. However, there are problems like 50 people claiming ownership of a single plot of land. “For certain plots the state administration has not been able to ascertain the beneficiary at all for payment of compensation,” he said. Coal India hopes to expand slowly with the help of some land that has been recently acquired. It hopes to resolve the issue in two months, executives said. 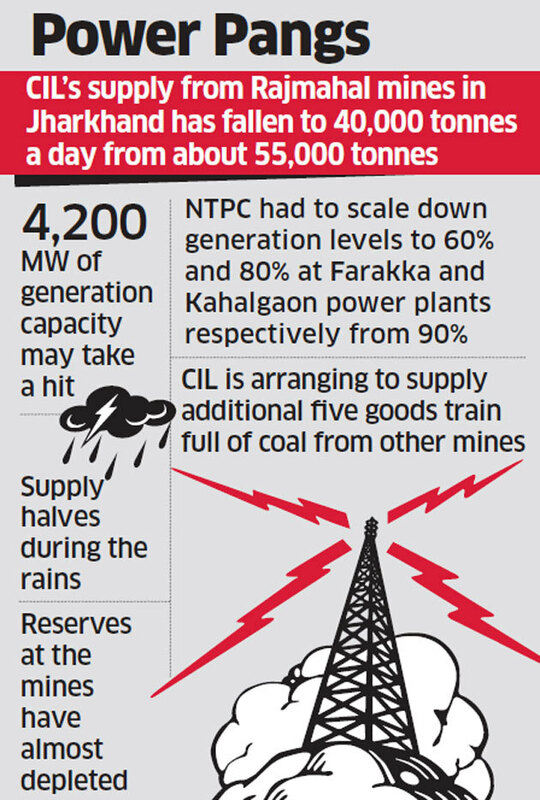 The NTPC executive said that if it doesn’t rain at Rajmahal, the Farakka plant is expected to keep running at 60% capacity utilisation while Kahalgaon is expected to run at around 80%. “However, any fall in supplies from Coal India may force us to shut down units or scale down utilisation further,” he said. Coal India is also arranging to supply additional five goods train full of coal from other mines. They are supplying around 18,000 tonnes of additional coal of which 14500 tonnes is being supplied to Farakka while the rest 3,500 tonnes is going to Kahalgaon. However, rains have also disrupted this supply in the recent past.